Global factory automation company, KEYENCE UK, has announced its CV-X and XG-X series multi-spectrum vision systems. They now offer new levels of colour detection performance that will yield broader application potential for consistent and stable quality inspection in automated production. 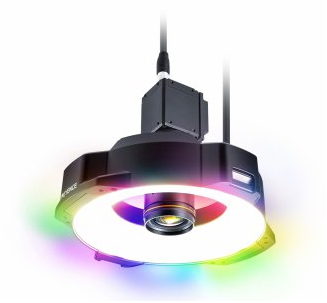 KEYENCE’s new 8-wavelength multi-spectrum ring-lighting technology combines with its high-speed monochrome cameras and advanced hardware and software for vision systems that offer flexibility in synchronised lighting, colour control, segmented lighting, and high-speed image capture - with uncomplicated system integration. The new CA-DRM multi-spectrum lighting unit supports eight wavelengths, including infra-red and ultra-violet, through dedicated colour LEDs. By harnessing the capabilities of multi-spectrum lighting, three operational modes can be selected or combined via easy-to-use software tools to provide an all-in-one image analysis solution that comprehensively covers colour recognition, form and shape, surface gloss, and target variability. This novel technology raises the bar for quality inspection through increased product certainty, higher levels of inspection stability and much improved waste reduction – benefitting quality control in applications from food processing to electronics production or from plastics manufacture to pharmaceutical quality control. The new ‘Multi-Spectrum’ mode utilises the high-speed monochrome camera and 8-wavelength lighting for visible and invisible light, effectively providing a non-interpolated colour to 2,568 gradations, compared to the 2,563 gradations provided by most conventional RGB colour cameras. This resolution provides superior results to allow ultra-precise fully automated sorting of even the most subtle differences in colour. High speed, real time images are synchronised with a single trigger input with no need for complex hardware integration. As well as a conventional ‘eyedropper’ or colour picker method for colour separation, much more specific measures can now be applied by intuitive selection from multiple images - if required with very narrow wavelengths as well as the ability to register excluded colours from detection. The second mode available to users of the CV-X and XG-X series multi-spectrum vision systems is the LumiTrax vision solution. This well-proven solution, pioneered on previous KEYENCE ring-lights and digital microscopes, solves the problems associated with conventional vision systems that require time-consuming trial-and-error to ascertain suitable image lighting conditions. By combining multiple images with lighting from up to eight different directions as well as ambient light - and furthermore through all the visible and invisible wavelengths available - images may be processed in a single operation to reveal height changes that generate shape or remove glare and halation. LumiTrax is particularly useful when setting up automated lines to detect surface conditions such as imperfections, embossed or stamped features on patterned, grained or coloured materials. Halation on film-packaged products or light-reflective surfaces can be easily suppressed to read characters or confirm presence of supplementary features. Scratches, scarring, spills and other surface defects are also easily catered for. The third 'Normal Illumination' mode avails the eight built-in colour LEDs of the multi-spectrum lighting system to illuminate targets in a variety of colours for optimal lighting conditions and quality inspection. With integrated easy-to-use tools that can capture multiple images and record colours and settings for every programme or product type, detection stability is assured simply and effectively without complex external controls - even when rapid product or processing changeover is part of the manufacturing process. Normal illumination mode may also be applied by selecting multiple wavelength images and lighting colours to detect surface features that would otherwise be difficult to analyse in a single colour. KEYENCE’s multi-spectrum vision systems are available as the CV-X series one-system solution and the customisable XG-X series that suits application-specific quality and inspection. The intuitive, icon-driven CV-X allows simple set-up for reliable product inspection whilst the XG-X provides flowchart programming for extremely flexible integration in large-scale automated machinery. Both variants offer a comprehensive selection of ultra-high-speed CMOS cameras and controllers supporting resolutions of up to 21M pixels plus a wide range of accessories. The CA-DRM multi-spectrum lighting units are available in nominal sizes of 50, 100 and 200mm and may also be equipped with dome and polarisation attachments. KEYENCE’s advanced hardware and software contributes to levels of inspection stability through features such as real-time intensity controls that maintain illumination and optimise LED performance over time. These systems are designed for high-speed production applications and can be adapted for use on-the-fly to further optimise production throughput. System integration flexibility includes plug-and-play set-up with PLCs, network compatible HDDs, PCs, PACs and touch panels using non-procedural Ethernet, USB, and RS232C, as well as Ethernet/IP and PROFINET protocol fieldbuses. A compliment of 24 IOs can be adapted for external sensors or may be used for direct PLC connection. As well as connectivity for camera and multi-spectrum lighting controllers, other hardware expansion includes mouse, monitor and SD Card storage for set-up and application data.